Activists gathered across South Africa, London, New York and Oakland, to commemorate the third anniversary of the Marikana massacre, the deadliest South African massacre since Soweto. South Africa’s apartheid system was overthrown in a negotiated process forced by a massive international popular movement backing the ANC, but the party has turned its back on popular forces. (This and the next two paragraphs based in part on The Shock Doctrine: The Rise of Disaster Capitalism by Naomi Klein.) During the long years of struggle by the ANC which were accompanied by pitiless repression by the National Party, (the apartheid-era rulers in South Africa), the guiding document of the ANC was its “Freedom Charter.” The charter, adopted after democratic consultations in 1955, calls for the right to work, to decent housing, freedom of thought, nationalization of mines, banks and “monopoly industry”; and land distribution so that all South Africans can share in the wealth of their country. Although the ANC had the moral authority to carry out its program, its negotiators tragically (and unwittingly) gave up all economic control, forfeiting their ability to carry out any aspect of their program. Within the next two decades this resulted in the economy being firmly in the hands of its numerically minuscule White business elite (which is tied to international markets). The country’s eyes were on the political talks between Nelson Mandela and F.W. de Klerk, in which the ANC decisively was the victor against the National Party’s attempts to dilute its loss of government control. Mining is a critical component of the South African economy, and the foreign multi-national corporations that own South Africa’s mines mistreat local workers with impunity. (This and the next paragraphs are based on Southern Insurgency: The Coming of the Global Working Class by Immanuel Ness.) Workers are often housed in substandard lodgings which lack water and electricity, and an increasing number of miners are hired as contingent workers. Not only do mine workers not receive support from the National Union of Mineworkers, the NUM actively joins with managements in oppressing its rank and file. The management of the company that owned the mine, Lonmin PLC, called in the police. Lonmin sought to have the strike declared illegal and demanded workers surrender the crude weapons they had fashioned to defend themselves. NUM drove a vehicle equipped with a loudspeaker through the nearby settlements, declaring the strike illegal. Workers gathered on the hill again on the morning of August 16 and were encircled by armed police. At 4 p.m., police opened fire, killing 16 workers as television cameras recorded and another 18 were executed off camera after fleeing the initial killings. Another 78 were injured. After two decades of ANC governance, South Africa is the most unequal country on Earth. The country’s gini co-efficient, the most common measure of inequality, was the world’s highest at 0.65 in 2011, according to World Bank statistics, and it is unlikely that this number has improved since. About 57 percent of South Africans live in poverty, and unemployment is 26.4 percent at the same time that only 80 percent of industrial capacity is being utilized. 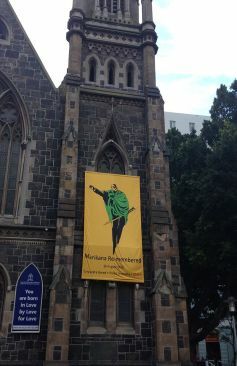 Article picture:Church on Green Market Square in Cape Town, South Africa with a banner commemorating the Marikana massacre. Source: Wikipedia.